Inspired by a photo of my daughter at Disneyland eating a nice big churro, I wanted to make them at home. It could not be that hard right? I spent much of this week looking through old cooking magazines that I had in a box, looking for inspiration of new recipes to try, when I came across churros in the Feb/March 2016 edition of Cook’s Country. It did not look difficult to make. They did not turn out an inch thick though, more like half and inch thick and some of them bubbled and looked like cacti by the time they were finished cooking, but they were delicious. My hubby, who is not normally a fan of churros, really liked these, so I guess they are a winner. The first time I made this, I forgot to add the sugar to the water – and as I was filling the piping bag with dough, I realized this… I threw out the dough and started over. Churros are pretty easy to make. A few tips, don’t overfill the piping bags – I had a hard time piping it with a tip on, so I just removed the tip so they did not have the fancy ridges, but they were still quite delicious – and I would make them again. The recipe said to refrigerate them before cooking, but I found that the ones that had come back to room temperature had fried up puffier and had a better texture, so I would skip that. Also don’t use a candy thermometer that does not have high temperatures… I overheated the oil and my thermometer broke! So, don’t do that! Line a rimmed baking sheet with parchment paper and spray liberally with a cooking spray. In a medium pot, over medium-high heat, bring water, butter, salt, butter, and vanilla to a boil. Turn off the burner and pull the pot off heat. Add the 2 cups of flour and use a rubber spatula to combine the flour until there are no more white streaks of flour. Transfer the dough to a stand mixer and beat on low for one to two minutes. Add the eggs one at a time, mixing until it is combined before adding the second egg. Increase speed to medium and beat for one minute. Fill the piping bag with half of the batter and pipe 6 long logs on the parchment lined pan, cutting the ends with kitchen scissors. Cook’s Country magazine had a step to refrigerate the dough for 15 minutes to an hour, but I think they fry up better when the dough is at room temperature. Preheat 2 inches of oil in a heavy skillet to 375 to 400 degrees Fahrenheit. Fry 3 to 6 at a time in the oil. You may need to use tongs to separate them as they fry so they don’t get stuck together. Fry them about two to three minutes on each side before removing them to a paper towel lined plate to drain some of the fat off. Repeat with remaining churros. In a glass pie dish or large shallow bowl, combine the half cup of sugar and 3/4 teaspoon of cinnamon. Once the fried churros are cool enough to handle toss them in the cinnamon sugar and enjoy! Categories: American Test Kitchen Recipe, Baking, Baking - Bread, Uncategorized | Permalink. When I think of summer, I think of peaches.. there are few things in the world that are as good as the peaches I have eaten in South Jersey – juicy, drippy, goodness. Well, I am in Southern California, and bought some peaches that were begging to be used up. 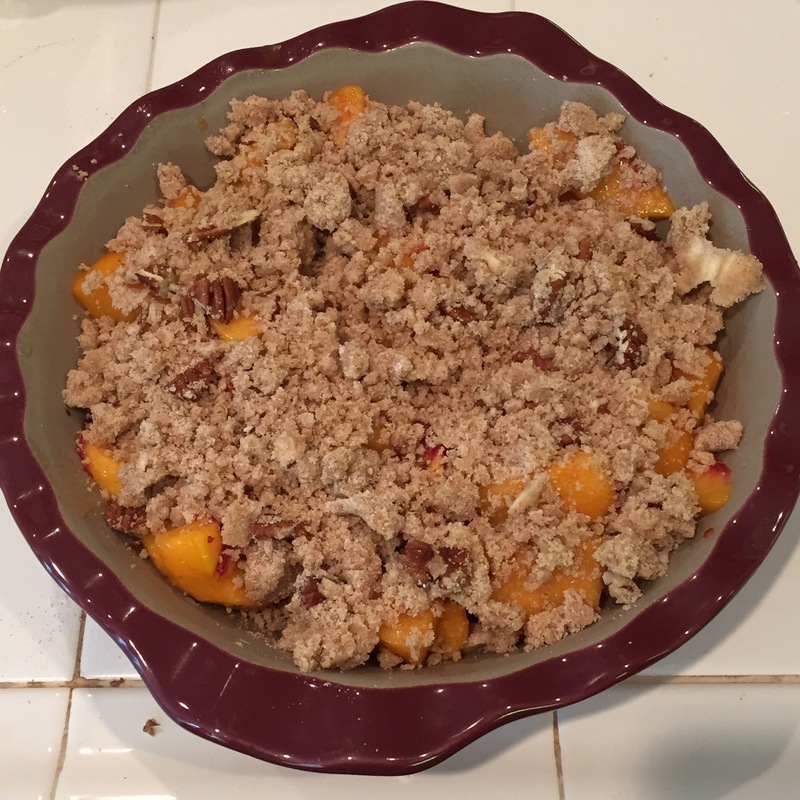 I found this recipe for Peach Crisp in my America’s Test Kitchen Cookbook. Unfortunately, I did not have as many peaches as the recipe called for, because two of them had gone bad, but I used what I had: 4 large peaches. Reading over the ingredients, I found I had everything except for lemon zest to make this dish, so make it I did. And yummy it was. Place the peach pieces in a pie dish. Add the sugar and lemon juice and stir to combine. In a small bowl, combine the flour, brown sugar, white sugar, cinnamon, nutmeg, and salt. Stir with a fork. Add the pieces of butter and work with your hands to combine them into a crumb like topping. Stir in the pecan pieces. Spread the crumb topping across the top of the peach filling. Bake in the preheated oven for 40 minutes. Cook an additional 5 minutes at 400 if the topping is not browned. Serve warm. Great with ice cream of whipped cream. Categories: American Test Kitchen Recipe, Baking, Baking - Desserts, Dessert - Fruit | Tags: America's Test Kitchen, Peach Crisp | Permalink. This recipe is from America’s Test Kitchen. 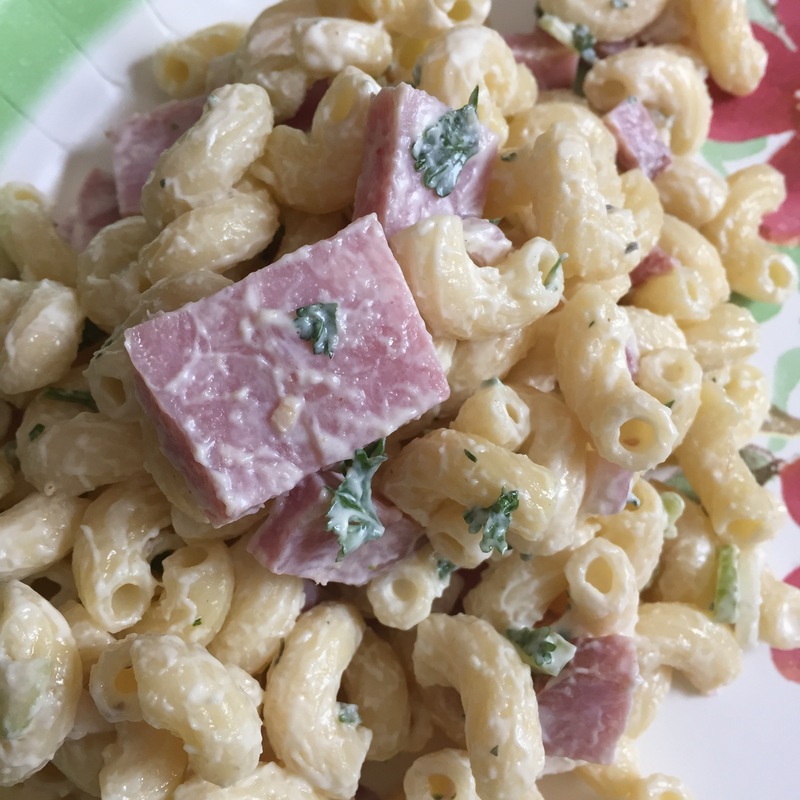 With Independence Day quickly approaching, I wanted to try a new recipe for macaroni salad. The ingredients caught my attention because of the addition of lemon juice. I followed the recipe exactly – and what I liked was that the dressing was not overly thick. The lemon added a nice fresh flavor to the salad. What I did not like is that it seemed to be lacking something else. I thought the parsley was overpowering. I would change that to something like basil – and I bought a ham steak, diced it up and added about 1 cup to the salad. It was now much better! It still is not my most favorite recipe, but it is a nice change from the same old same old. I also added about 1/2 tsp of Spike seasoning to the salad. It is a seasoning I use in my Hawaiian Potato Mac salad and really like the flavors that it adds. Bring a large pot of water to boil and add 1 tablespoon of salt to the water and cook the elbow macaroni according to the package directions. Do not overcook the pasta though, you want it to still have some texture once you add the dressing. Drain the pasta. Rinse the pasta in cold water and give it a quick drain (you want to keep a little of the moisture of the water in the pasta – it will keep the dressing from becoming overly thick. Combine the chopped red onion, chopped celery, chopped basil (or parsley), lemon juice, Dijon mustard, garlic powder, cayenne pepper in a small bowl and add these to the cooled macaroni salad. Stir together and allow to sit for 2 or 3 minutes to allow the flavors to absorb. Add the mayonnaise to the pasta and stir to combine. Season with Spike if you think it needs more flavor. Add the chopped ham to the pasta salad and stir. Chill until serving. Categories: American Test Kitchen Recipe, Side Dish - Pasta, Side Dish - Salad, Side Dishes | Tags: America's Test Kitchen, Cool and Creamy Macaroni Salad, Macaroni Salad, Pasta Salad | Permalink. Here is another lovely salad that I made. I found this recipe in my America’s Test Kitchen Healthy Family Cookbook on page 74. I love most of the recipes that I have tried from America’s Test Kitchen. They are on TV on PBS as well. 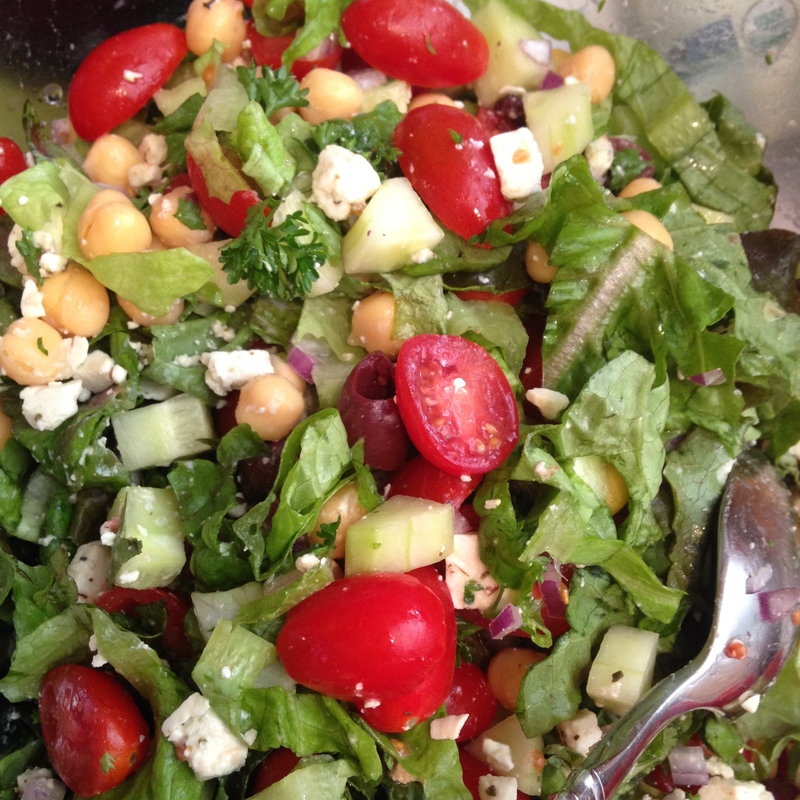 Combine the salad ingredients in a large salad bowl. Combine the dressing ingredients in a small bowl and whisk to combine. Pour over the salad and gently toss the salad. Categories: American Test Kitchen Recipe, Eat Fresh!, Meltdown Challenge Recipes, Side - Vegetable, Side Dish - Salad, Side Dishes | Tags: America's Test Kitchen, Mediterraniean Chopped Salad | Permalink. Cooking brown rice has been a struggle for me. I overcook it and it is mushy, under cook it and is crunchy. Rice cookers have not been the solution to this problem either. I found this recipe from America’s Test Kitchen, which bakes the brown rice in the oven in a covered casserole! Success at last and this method yields a nice nutty, fully cooked rice that is pure perfection!. I added dried parsley and dried garlic for additional flavor. I found my covered stoneware did a fantastic job of steaming the rice in the oven, but a Pyrex dish covered in foil will do the job according to ATK. Place the Basmati rice in your stoneware (one that has a lid would be perfect). 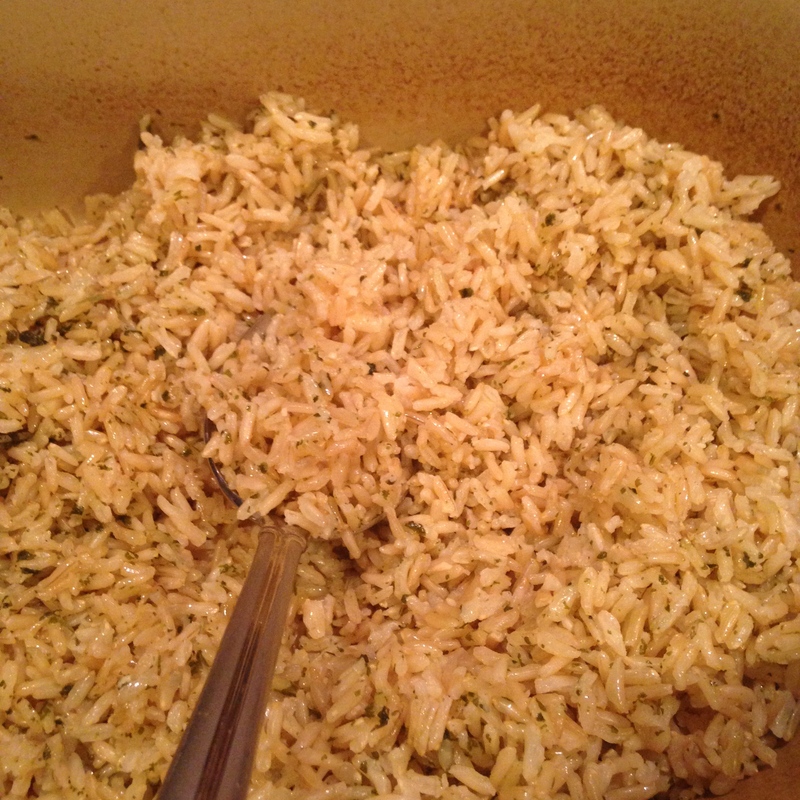 Add 2 1/3 cups boiling water to the rice, add olive oil, salt, dried parsley and minced garlic and stir. Cover with lid (or foil, doubled to ensure a good seal). Bake at 375 °F for 60 minutes. Remove from the oven, remove the lid. Fluff the rice with a fork. Cover the casserole with a clean kitchen towel and allow to steam for 5 minutes. Remove the towel and allow to sit uncovered for 5 more minutes and then serve. I will be baking my brown rice from now on! This is the way to cook it. Thank you once again America’s Test Kitchen. Categories: American Test Kitchen Recipe, Side Dish - RIce, Side Dishes | Tags: Baked Brown Rice, Baked Rice, Basmati Rice, Perfect Brown Rice | Permalink.